Here is the pdf worksheet for the Arabic present tense (Fi’il Mudari’). I’ll be using this sheet in this Saturday’s lesson with all three of my classes insha Allah. It’s a simple cut out activity where students need to place the correct cut out in the present tense table. This worksheet will be given after we have read through the explanation. The act of cutting out will help those students who are kinesthetic learners. The colours will help the visual learners and for auditory learners it will be useful to ask them to read the cut outs out loud as they stick them on the table. I hope this helps you iA. 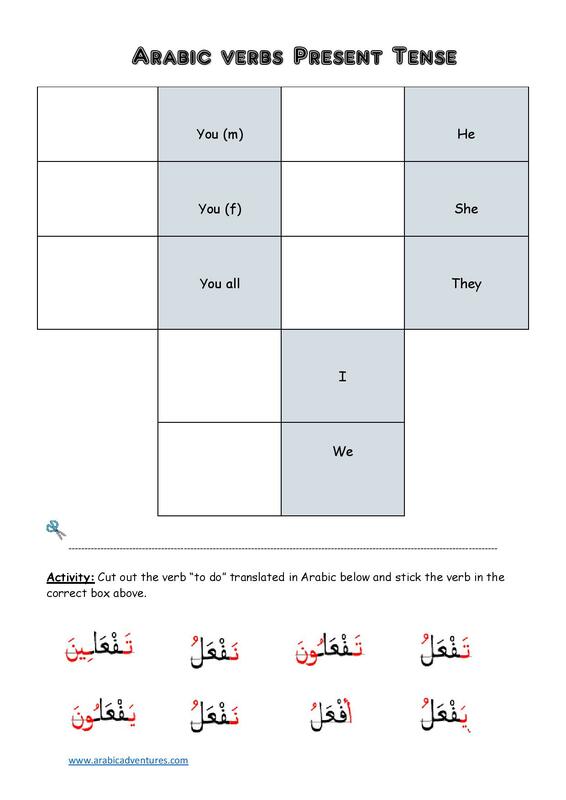 This entry was posted in Arabic Grammar, Arabic worksheets and tagged activity, arabic, arabic game, arabic grammar, arabic grammar review, Arabic Language, Arabic lessons, arabic printables, Arabic verbs, arabic worksheet, Fi'il mudari', fun arabic worksheet. Bookmark the permalink.